You and your cat will adore this Savic Nestor ImpreΒion Litter Box – Kitten Ribbon, not only because of its chic design but for its functionality as well. It features a large, foldable front, which makes cleaning easy and convenient. The extra tall base tray protects against leaks, making it perfect for those cats that like to stand up while they tinkle! The hood with integrated handle can be easily connected to the Savic Nestor ImpreΒion Litter Box – Kitten Ribbon tray with two clips. The active carbon filter is inserted into the hood in front of the ventilation slots, so that unpleasant odours don't escape. The filter should be changed at regular intervals to ensure its continued effectiveneΒ. The hood and the transparent swing door flip open to allow for easy acceΒ to the inside of the litter tray. 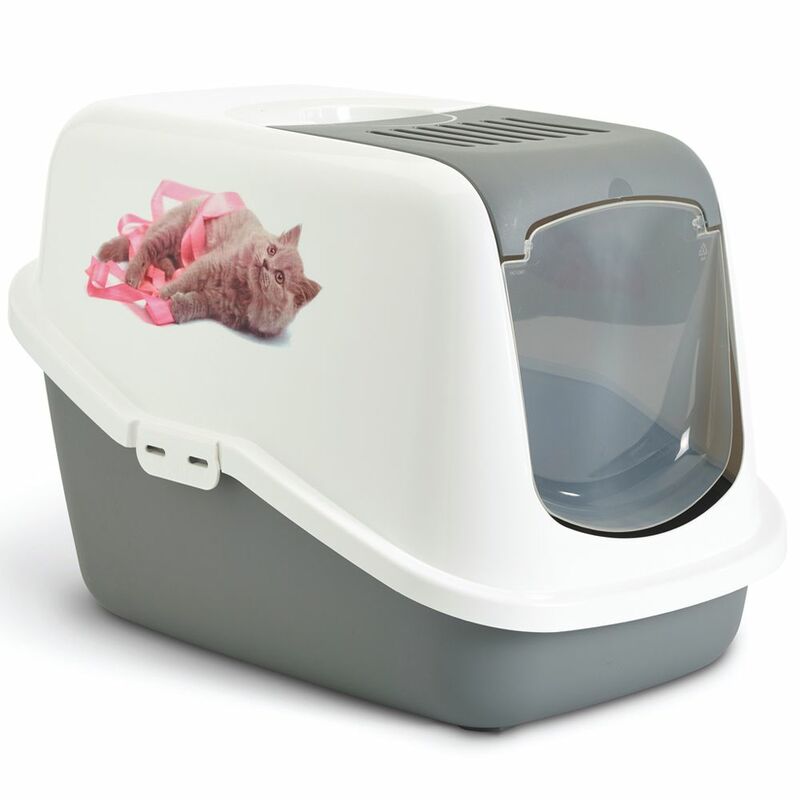 The Savic Nestor ImpreΒion Litter Box – Kitten Ribbon is also perfectly suited for nervous cats or kittens who are not yet used to using a covered box, as you can simply leave the hood folded up until your feline friend is accustomed to the new space. Savic Nestor ImpreΒion Litter Box – Kitten Ribbon at a glance: Hooded designer litter box with hinged front and cute cat and ribbon motif on both sides Easy acceΒ for cleaning: swing door and hood can be completely folded back Extra deep tray: suited even for cats that like to tinkle standing up Lowered entrance Active carbon filter: included with the product Low build-up of odours Made in Belgium Swing door made from transparent plastic: see-through and swings smoothly Carry handle: integrated into the hood Colour: light-grey/white with Kitten Ribbon design on both sides Dimensions: Total dimensions: 56 x 39 x 38. 50 x 34 x 12-25 cm (L x W x H) Entrance: 21 x 20 cm (W x H) Entrance height: 14cm Tip: The catches on the flip-up cover might initially be a little stiff. If this is the case, zooplus recommends pushing the catches slightly inwards to make it simpler and quicker to open and close the cover. Sizing for Savic Bag it Up Litter Tray Bags - Maxi: Suitable for trays up to: 55 x 43 cm (L x W) Contents: 12 bags More information about Savic Bag it Up Litter Tray Bags can be found here: Savic Bag it Up Litter Tray Bags.